At Colossus Bets we offer sports betting pools. Pools betting works in a similar way to a lottery, where all players purchase tickets and the jackpot prize is shared between all winners. Here we explain, exactly how pools betting with Colossus works. One unit = £2. So if you were to place a £1 stake, this is the equivalent to 0.5 units. At Colossus Bets we offer four stake tiers: £2 (one unit), £1 (0.5 units), £0.50 (0.25 units) and £0.20 (0.1 units). Playing with lower stakes allows you to play for a lower cost but also lowers the prize you will play for. When making your selections, you can choose as many outcomes for an individual fixture as you wish – this will mean that your overall ticket cost will rise. On correct score pools, we offer an other selection for home wins, draws and away wins. These selections cover scores not specifically listed. For example, an other home win selection would cover the home team winning 5-0 and 5-1 but not 3-2. At certain times, Colossus Bets will make an offer to buy any potentially winning (live) tickets. These offers typically are made between the end of one match in a pool and the start of the next match. In selected markets, there may also be offers made at half times. 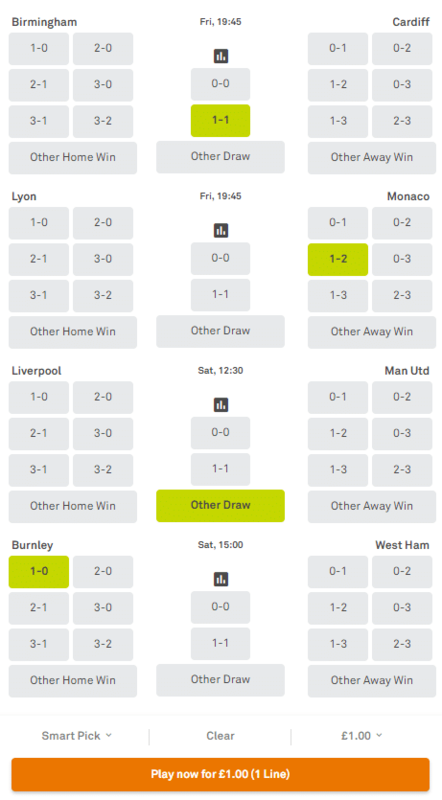 Customers have the opportunity to sell all or a percentage of their ticket to Colossus Bets as shown below. For example, at half time in the third leg of a Pick 4 pool where a customer has a ticket which is ‘live’ Colossus Bets makes the customer an offer of £2,500 for their ticket. The ticket is a full unit stake (£2). The customer decides to cash out 50% for £1,250. They now have £1,250 and still holds 0.5 units in the pool. Similar to a lottery, the jackpot is shared between all winning units. To ensure that the prize for the pools is always significant, our pools have minimum jackpot guarantees. If stakes entered into a pool (after deductions) exceeds the guarantee, then the jackpot becomes the value of the stakes in the pool. For example if 4 units won a Pick 4 pool with a £30,000 jackpot, each unit would win £7,500 (30000/4). If you placed a £2 stake, cashed out 40% and the ticket won. Then you would win £4,500 (60% of 4,500) plus how much you cashed out for. If you placed a £1 stake into a Pick 4 pool with a £30,000 jackpot. Then you have 0.5 units in this pool, so the jackpot winnable for your ticket would be £15,000 (50% of 30000), as shown below on both desktop (top) and mobile (bottom). If a pool is not won, the stakes held will carry forward in a rollover to the next pool. Our pools also have consolation prizes! These are prizes for almost winning the pool. If you played a Pick 15 with consolation prizes and were correct in 14 of the 15 legs. Then you would win a share of the consolation prize for 14 of 15. So if, 2 customers were both correct in 14 out of 15 legs, they would each win £10,000 despite having a losing ticket. Now you’ve had a run-down of how pools betting with Colossus Bets works. You can play pools such as The Colossus and the Pick 6 here.